We’d love your help. Let us know what’s wrong with this preview of The Reaper's Touch by Robert Southworth. To ask other readers questions about The Reaper's Touch, please sign up. What I’ve always really enjoyed about Rob’s work is that I’ve been there from the first book and I can really see how he’s grown. Don’t get me wrong.. I never found fault with any of his books but this one just seems a step above the last as he continues to rattle out f For me this has to be one of the most hotly anticipated releases this year. Rob likes to tease us readers and keep us waiting but it’s worth it. Rob’s never given me anything other than a 5* book previously and he’s done it again. So this is the second book in the Ripper Legacies and we are back with William Harkess and his rabble of men as he joins forces with Inspector Abberline to hunt down The Ripper. This time his foe is more dangerous as William becomes more of an annoyance to him. In my opinion, this is one of the best Ripper-style books to come out this century. Using a very uniquely recognisable style, the author has created a gripping alternative story to the tale of Victorian London's infamous killer. The main protagonist is a fictional character brought in to find the killer/killers and the author weaves the backstory of this character into the embedded tale of a mass serial killer, so cleverly that the reader is immediately hooked. The first book was excellent but t In my opinion, this is one of the best Ripper-style books to come out this century. Using a very uniquely recognisable style, the author has created a gripping alternative story to the tale of Victorian London's infamous killer. The main protagonist is a fictional character brought in to find the killer/killers and the author weaves the backstory of this character into the embedded tale of a mass serial killer, so cleverly that the reader is immediately hooked. The first book was excellent but this second is even better, more tension and nail biting, gruesome but not gratuitous, with well developed characters that are engaging and realistic. Mr Southworth uses a style that fits well with Victorian England, using the language of the time without the usual London stereo-types. This was my first time reading a book by this author and I have not been disappointed. Mr. Southworth has done an excellent job of betraying life in 19th century London. In the 'The Reaper's Breath' the author has taken some of the real life characters from the real life investigation into the Jack the Ripper case and them placed alongside fictional characters. To to create a interesting look at the killings of Jack the Ripper and the reasoning behind them. For those of you who like me often read Jack the Ripper book , this one offers a refreshing look at the killings and the perpetrator. 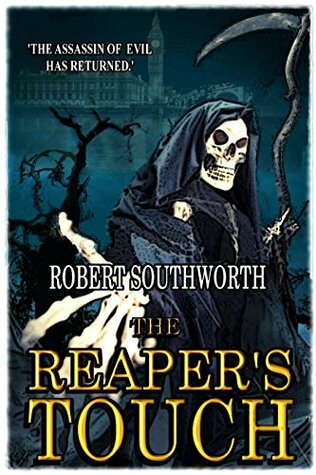 Robert Southworth's second book in the series.